Neoclassical buildings with wrought iron balconies host a plague of graffiti. Tags from the inane to the profane mark each and every wall – a reminder of the area’s antiestablishment ties. Today, however, this central neighbourhood is a cultural must visit in Athens. With a distinctly different vibe to any other part of town, Exarcheia has retained its old world Greek charm while welcoming in a new artistic crowd. Galleries Hot Wheels and CHEAPART host a regular rotation of shows featuring local and international artists. With new openings every month and a handful of popup artists’ studios like 3 137, this is the place to see the city’s burgeoning underground art scene. Exarcheia has long been a symbol of opposition to the establishment. It was here that, in 1973, the Athens Polytechnic uprising took place, when students demonstrating against the dictatorship were met with a tank, killing 24. More recently in 2008, violent riots exploded here, with residents setting police cars alight in anger at the police shooting of a 15-year-old boy. 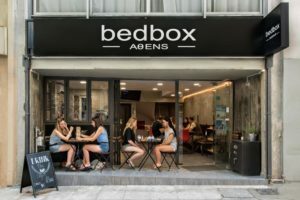 Today, graffiti tours of the area (try Magda’s through guruwalk.com) offer an alternative insight into Athens’ political and economic situation while the lively kafeneion and meze scene is a draw for those wanting to rub shoulders with city creatives in an authentic Greek setting. Coffee culture is strong in Exarcheia, with a “kafeneion” on every street corner. Stroll down Koletti Street in central Exarcheia on a Tuesday afternoon and you’ll find twentysomethings pouring out of trendy cafe-bars like Cusco and Karagiozis, whiling away hours in the dappled shade of orange trees, nursing sludgy Greek coffees. Coffee shops here aren’t sterile spots to plug in your MacBook; neither are they the preserve of old men smoking camels as is the case in many Greek kafeneions. At Chartés, old school jazz floats out of the open doors and into the street where young people smoke, sip coffee and play backgammon as their grandparents might have 70 years ago. Meanwhile Mauros Gatos on Koletti serves as the sweet spot between an afternoon coffee slot (that’s 7-9pm on Athenian time) and cocktails in speakeasy surroundings. If you can handle the cigarette smoke, the tiny Intriga Bar is a local favourite. Inconspicuously tucked off Exarcheia’s main square and open till late, it serves cheap drinks, classic rock and a glimpse of the anarchic side of the neighbourhood in its subversive crowd. In the city centre but much more affordable than moneyed Kolonaki next door, Exarcheia’s a bewitching mix of neighbourhood institutions drawing a young crowd. “People like the restaurant’s character because it used to be old school,” says our waitress at Ama Laxei, the longstanding taverna on Kallidromiou Street that draws well-seasoned locals to its fairy-lit garden. At Ama Laxei, traditional Greek flavours are brought up to date – think moreish meatballs in a spearmint, ouzo and tomato salsa or deconstructed galaktoboureko for dessert. There’s even sourdough – one foodie obsession the modern Greek diet is yet to adopt. The colour-saturated weekly farmer’s market (or laiki) which runs the length of Kallidromiou Street every Saturday is another institution for the new Exarcheia. Located beside Lofos Strefi – a verdant hill at the top edge of the area where people gather to meet, drink Mythos beer and watch the sunset over Athens and the Acropolis – Kallidromiou is a microcosm of Exarcheia’s diverse residents. And the laiki is at its heart. Every Saturday from 8am to 4pm, families, young artists, refugees, pensioners, even the anarchists hit up the laiki for cheap, bountiful fruit and veg that taste like sunshines. After they’ve done their shopping they spill downhill, the hipsters heading to Yesterday’s Bread, a vintage shop packed with 1970s, 1980s and 1990s finds (way more reasonably priced than its counterparts in Monastiraki – think 1990s Tommy Hilfiger for under €10). Meanwhile Café Paraskinio and Café Erodios are in prime position for people watching. Or, to really live the Exarcheia lifestyle, grab a beer and take it to the steps leading up to Lofos Strefi. That’s where most locals perch for a full view of Exarcheia’s colour: fruit, people, graffiti and all.